When you visit Ayllon, you will get the feeling of having entered into the full splendor of the medieval age and funnily enough, the town keeps this spirit alive in the midst of modern times. 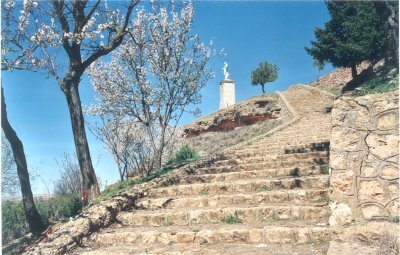 The simplicity of the people of Ayllon and above all, their cheerfulness, is the best therapy for visitors, making them forget all the tensions and problems of our world. Those of you who love art are filled with culture and at the same time, with that special peace which makes you feel so good. Ayllon was declared of national, historical and artistic interest in the 1,201/73 decree on the 19th of May and has won various prizes including first prize in the beautiful towns contest in 1973 and was runner up in the national competition nearly winning first prize in 1974. 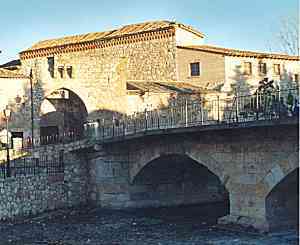 Cross the Roman stone bridge over The River Aguisejo and you will find yourself before a hard door which looks like it was made for times of war and which was the entrance to the castle. 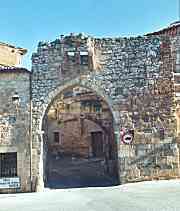 Today it is called 'The Arch' by the people of the town and is the main entrance to the town. Then, in front of you, is the palace of Juan Contreras. It seems this character, who eventually came to live in Ayllon, was one of the most important aldermen of Segovia and was present at the coronation of the Catholic Queen Isabel which was held in Saint Michael's atrium on the 13th of December, 1497. The palace has an impressive Isabelline style façade. Inside, different styles of panelling which have been kept in perfect condition, can be seen.There is a reproduction of this building in El Poble Espanyol on the mountain of Montjuïc. Walking along, a few metres from the palace of Juan Contreras, at the end of a narrow street, appears an open, well-lit space called the Plaza Mayor. It is a magnificent medieval-looking square with its antique wooden colonnades and in the background, stands the Town Hall, which was apparently, the first palace owned by the Marquis and Marchioness of Villena whose coats of arms can be seen on the facade. 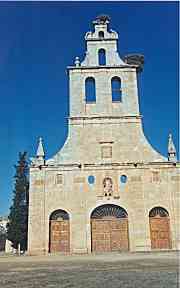 It was handed over to the Ayllon Council in about 1620. Right next to it is Saint Michael's Church with its Roman apsidal chapel which probably dates from the 13th century and features the coats of arms of the Contreras family on the façade. It has a magnificent doorway and inside, lay the earthly remains of noble men and women. 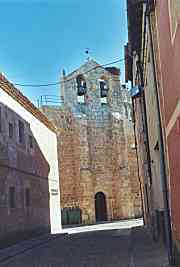 Walking across the square, to the left, in front of Saint Michael's Church, stands the 'Casa de la Torre' (Tower House). 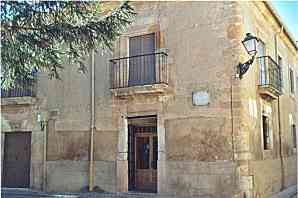 It is the oldest building in the town and served as Headquarters for the Spanish Civil Guard. Now renovated, the ground floor has been occupied by the Caja de Ahorros de Segovia Bank and above that, there is now a centre for retired people. 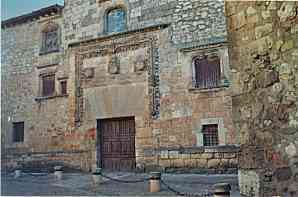 This building has also been reproduced in the Poble Espanyol in Barcelona. Continuing along Pozo Street, we can see the palace-like home of a Bishop known as 'Obispo Vellosillo' which dates from the 16th century. It has an interior patio, a stone staircase and period panelling, and the Vellosillo family coat of arms can be seen adorning the doorway and each of the windows and balconies. Don Fernando de Vellosillo took part in the Trento Church Council on the 18th of January, 1562 as a theologist and was later named Councillor by King Felipe II as a reward for his work. In 1566 he was made Bishop and Lord of Lugo. 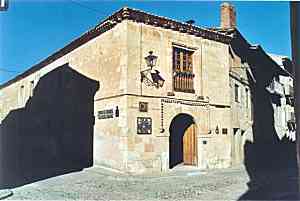 Walking along the right hand side of the Plaza Mayor, on the Corner of Parral Street, there is a palace which it is said, belonged to Empress Eugenia of Montijo. 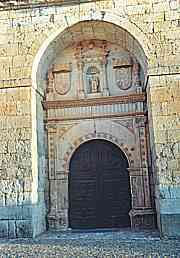 The coat of arms belongs to the Portocarrero family and in front of the building, in La Plaza Ángel del Alcázar, is the Santa Maria la Mayor Parish Church. 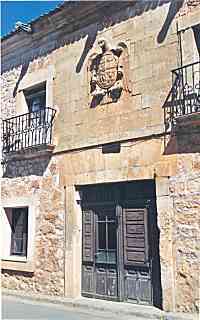 Following on from the Santa Maria la Mayor Church, on Real Street, there is another ancestral home which everyone calls the 'Casa del Águila' (House of the Eagle) because of the coat of arms on the wall. 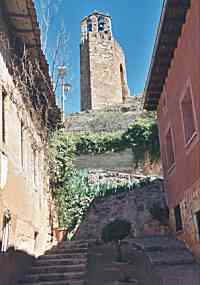 Walking down Real Street, a little after 'Casa del Águila', along a narrow Street , appears in all its splender,'La Martina', a stone tower with its corresponding battlements, situated on the edge of the wall which overlooks the town, and which is said to be the remains of the Castle of Don Alvaro de Luna. During the day, it appears graceful and elegant as if time had stood still. You can reach it from many other narrow streets but it can be seen more clearly from here. Nowadays, at about twelve o'clock, it continues to carry out its function of announcing midday with the ringing of its bells just as it reminded labourers in the fields long ago, that the time had come to say the Angelus prayer. At night, when silence and darkness reign over the town, 'La Martina' is transformed and what looked like a graceful and elegant tower in the daylight, now appears to be an enormous owl, expectantly watching over his beloved town like a tireless sentry. 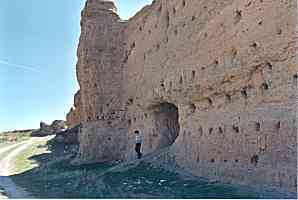 A large wall called 'Los Paredones' also remains as one of the relics of the arab occupation in the 18th century. Built as a thick block, it fortified the hill of the castle. 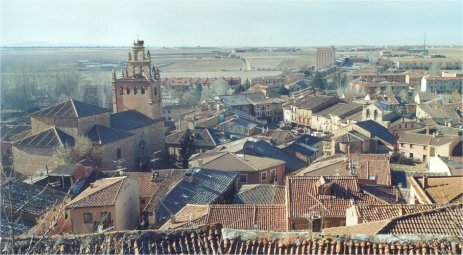 It is thought that the stones used to build the walls which surrounded the town, were taken from there.There are still lots of remains of the wall like those on Alarves walk and on the road to Soria. Walking on, at the end of Real Street, stands the Convent of the Immaculate Conception which was founded by the Marquis of Villena. Nowadays, the nuns run a hostal for visitors to the town but in the 1940's -80's, it was run as a school. Many students, too numerous to mention, have been educated there, including me, your guide, and our childhood memories nostalgically take us back there when we remember Sr. Teresa, Sr. Anuncia and Miss Garay, who was loved by all, and who taught us to be, as she used to say, good people. Part of the Convent is taken up by a Church, inside which is a beautiful statue of the Immaculate Conception, made by Alonso Cano. 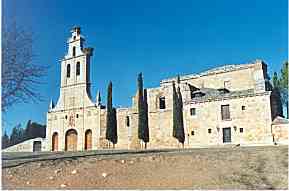 Outside the town, next to the Aranda de Duero Road, is the Convent of Saint Francis which is now commonly known as: "El Exconvento". 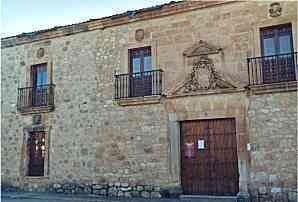 If devout tradition has it that this holy house was founded by the angelic patriarchal de Asís, and if history would have us believe that the future King of Aragon, Don Fernando de Antequera, Lord of Ayllon, stayed here as a guest in the summer of 1411 while the Royal Court remained in this town, and if this monastery was visited by the popular Dominican friar from Valencia, Saint Vincent Ferrer, where no doubt important conferencies were held, and if inside those walls ladies and gentlemen of noble blood such as the Daza family, the Vellosillo family and the Pacheco family and the no less important Chaves and Temiño families or even the Count of Saint Steven de Gomaz himself, then one cannot voluntarily forget to visit this historical and monumental jewel. Though the transformers of the last century, with their plundering, looting and secularization, desecrated this holy place, it still remains standing, showing the static majesty of it s" bell-gable" (Construction that the tradition franciscana imposed, with rare exceptions, to move away of the ostentation that meant a bell tower in his communities), its belfry looking to the sky, the classical raised reliefs of the Evangelists, its coats of arms and the stone statue of Saint Francis. The "Exconvento" estate was owned by Julio Montejo in my childhood and we used to play there, little aware of its great historical importance. It was later sold to a famous doctor who reformed it. It is still his property and is now closed to the public. Every year, on the 3rd of May, the day of 'La Cruz' (The Cross), the people of the town make a pilgrimage to the facade of the 'Exconvento' and organise a festival there in which everyone participates from the youngest to the oldest, and in this way, the tradition is kept alive and passed on from parents to children. 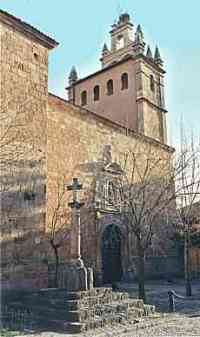 It is their way of reliving that splendid period of the history of Ayllon.